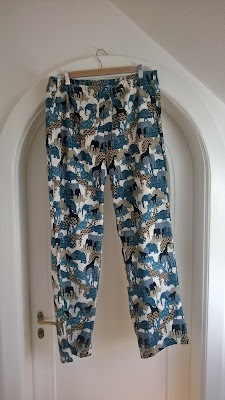 Yay, these pajama pants for my husband are finished and I can move on to the next project. The pattern is #134 from Burda Style 12/2010. The fabric is cotton and is a remnant I bought from a department store in Stuttgart. I did the waistband a little differently than on past pants I've made him. Usually I use an elastic that has a drawstring in it, but this time I put elastic along the back only and attached drawstrings to it for the front. Not much else to say about them, since it's super easy to sew drawstring pants.